It's going to be quite a scene this Sunday on Church Avenue. Top professional road racers from all over the country will be diving into corners and hurdling themselves down Dickson Street at speeds even cars aren't allowed to go. The Joe Martin Stage Race finishes up 4 days of racing with a downtown criterium. 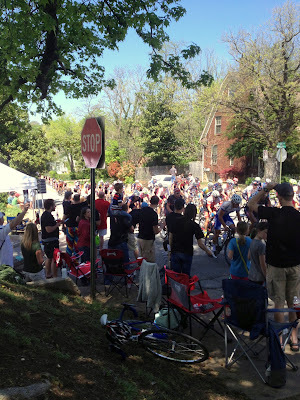 If you've never watched a bicycle race before then Sunday is the time to grab your chair, cooler, cowbells, a couple friends you like talking to and park yourself in and around downtown Fayetteville. I stumbled upon this race about 10 years ago and told myself I've gotta get a bike. That's all she wrote. One of the best places to watch the race is on Church Avenue. The racers will climb a hill (Church Hill) every lap. It is the slowest section on the entire course. 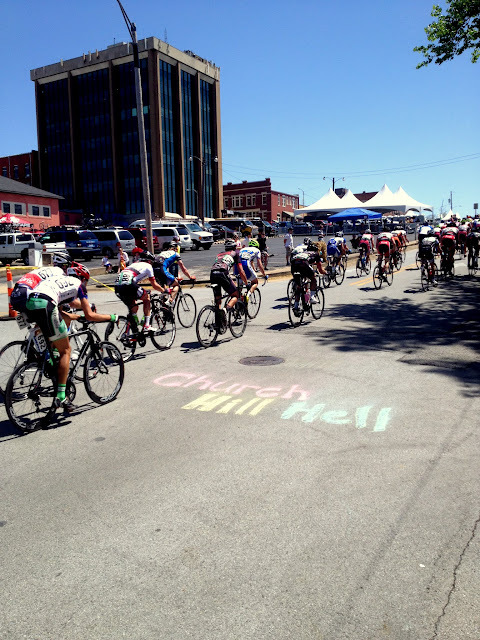 I am told the Friends of Church Hill will be out in full force along with The Bike Route to celebrate the last day of racing. According to Steve, "There will be tents, chairs, coolers full of adult bevs, 15 lbs of locally grown bacon, eggs & lunch fixins. It will be a day full of cheers, jeers, bloody's and beers." The bacon hand ups last year were popular with racers. I invite you all out to participate in the grand spectacle that is bicycle racing. You will be amazed at the speed and skill of the professionals and perhaps even see yourself in the amateurs. Did I mention the FREE kids race. Checkout the schedule of events below. "That's too much bacon" said...no one EVER! Bacon hand ups. Indeed that is a great spot. You have so many races. You should at least walk off the beer & burger by moving around a bit!